Breakfast is the most important meal of the day, since it provides us with the “fuel” necessary to jump-start your day. However many of us are too busy in the morning to fit this meal into our schedule, thus most people skip it altogether, or just grab something quick on the go, like a cup of coffee. I try to have breakfast every morning, and on weekends I put an extra effort to make it a little more special. I love making pancakes and waffles from scratch. Recently I received a very nice Cuisinart Waffle Maker, so today I will share my daughter’s recipe for Buttermilk Waffles. These are very light, fluffy, moist, and healthful for you. These waffles are best served fresh, but you can also freeze them for later use. In a large bowl, beat eggs until smooth. Using a whisk, mix in the melted butter, to make emulsion. Stir in buttermilk, and your favorite extract. Preheat your waffle iron per manufacturer instructions. Fold the wet ingredients into the dry mixture. Mix just until combined, but not smooth (batter should be lumpy). Let the batter rest for 5 minutes. Spray your waffle iron with cooking spray (repeat before each use). Pour 3 oz of batter (a little less than 1/2 cup) onto your preheated waffle iron, close the lid. Do not open the lid until the green light is back on (on this particular waffle iron), or check your operating instructions of your waffle iron. Serve with fresh fruit, your favorite syrup, whipped cream, ice cream, or whatever your little heart desires. 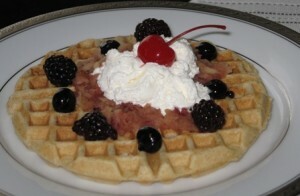 (I served mine with sauteed apples, fresh Blueberries and Blackberries, whipped cream and a little bit of syrup). To freeze these waffles, you need to make sure they are completely cooled off, then place a piece of waxed paper between each waffle, before placing them in a freezer compatible plastic bag, seal well, and freeze up to 3 months (but I'm sure you will not resist to keep them there that long). I always date my freezer bags, so I know how long the food has been frozen. Thank you for all of the recipes. Ethan has a social studies project to present Pulaski Day activities and Polish customs. I thought about making his class the donut recipe you posted…any other suggestions? He also wants to dress up for his oral presentation…I thought a decorative vest and a hat? I will keep them coming as long as time allows me to do so. These donuts are good, but to make them for a whole classroom, might be a lot of work. If you decide to try this recipe, I would advise you to double it.